Why this awesomely tangy, sweet/salty native fruit hasn’t taken the world by storm is beyond me. Or maybe it’s a good thing, for us foraging types. 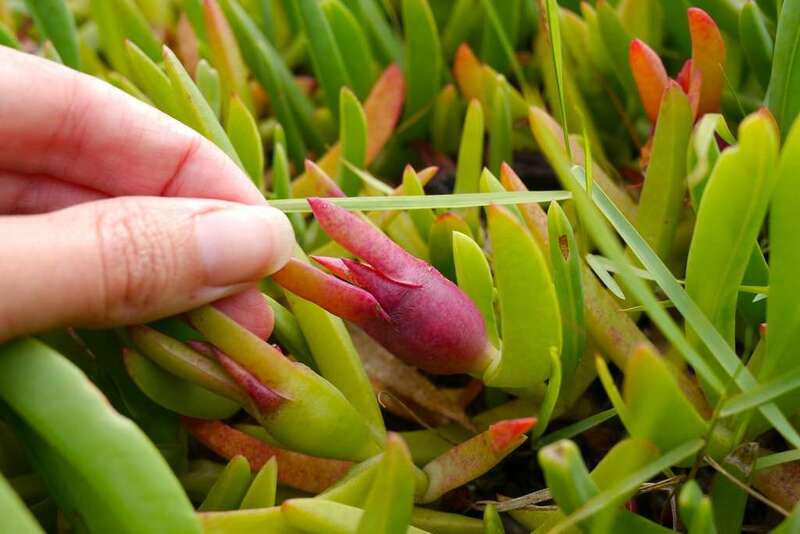 I’d like to introduce you, if you’ve not already met, to Carpobrotus glaucescens – the variety of pigface that grows on the sand dunes and costal cliffs of eastern Australia. Every part of this plant is edible and/or medicinal – the leaves can be used like aloe vera to lessen stings and burns of the skin, as well as eaten raw or cooked. 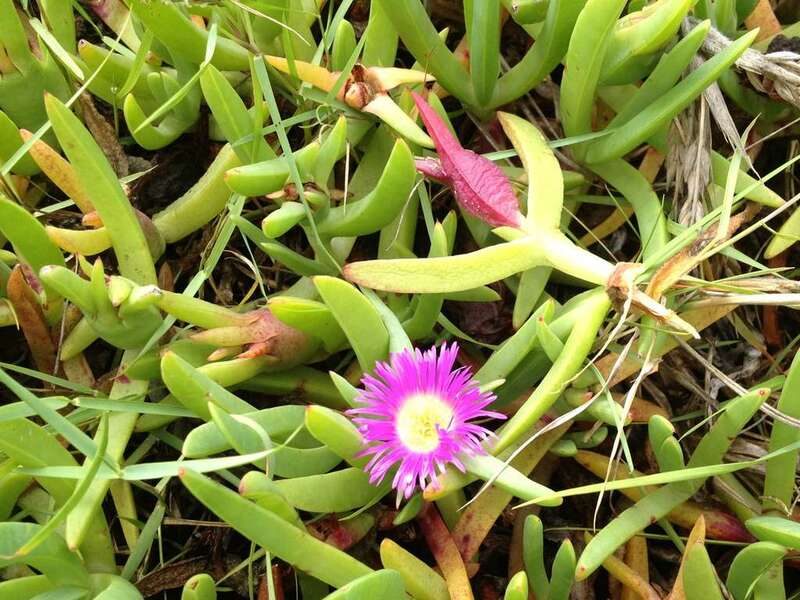 Pigface has been eaten and used extensively by the peoples of Australia for as long as there’s been people here. Outside bush tucker circles, I believe it is not much harvested at the moment, though white settlers used the fruit for jams and jellies, and the leaves cooked as vegetables. But it’s the fruits that i grew up snacking on… they are hands-down delish – somewhere between a kiwifruit and a strawberry and maybe a fig, with a good whack of salt. 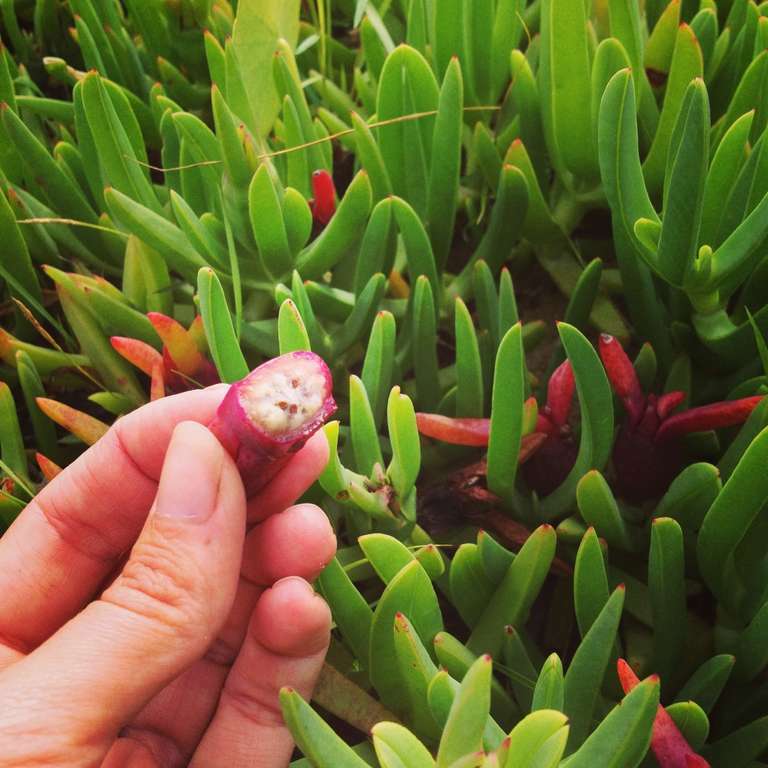 The pigface fruit ripens, of course, when the flower is pollinated and spent. The fruiting body swells up and turns deep red, so they’re easy to spot on the otherwise green plant. Some (perhaps most) folks peel the fruit, but I like them whole – you get that extra salty hit before you get to the sweet interior – a bit like the effect of the sweet/sour in a cumquat. Inside, the fruit has a texture reminiscent of strawberry. Downright delicious. 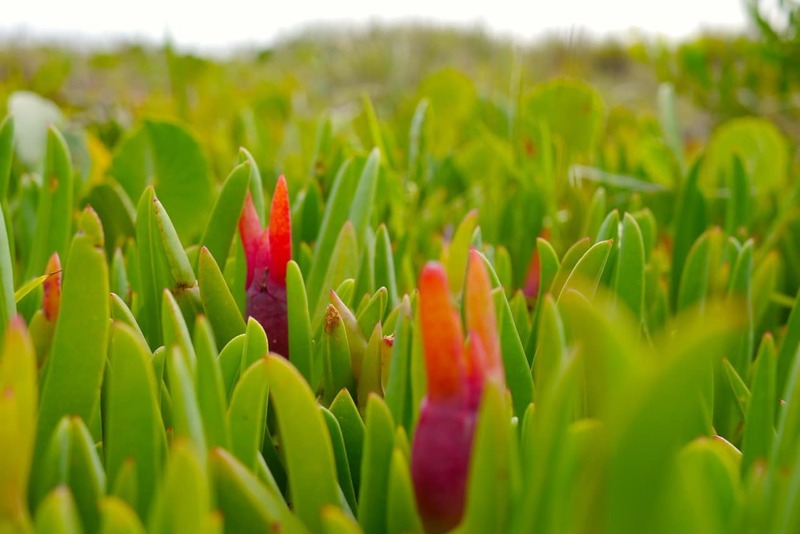 If you’re looking to go foraging for pigface fruit, keep in mind that they’re an important part of the ecosystem – they stabilise the sand dunes and soil, subsequently helping to build fertility. Their flowers support bees and insects. 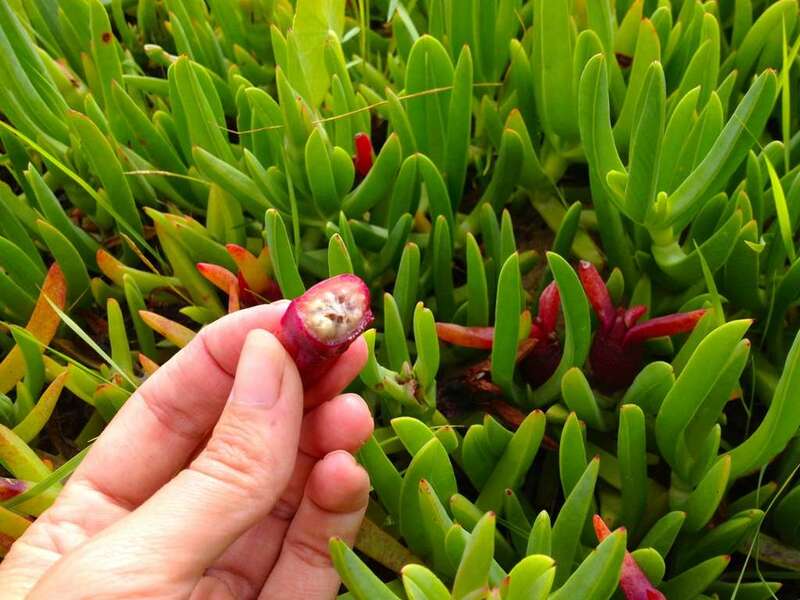 So try not to squish the plants as you harvest, and of course leave some fruit for the birds and other critters, who play a crucial role in pigface’s seed dispersal. 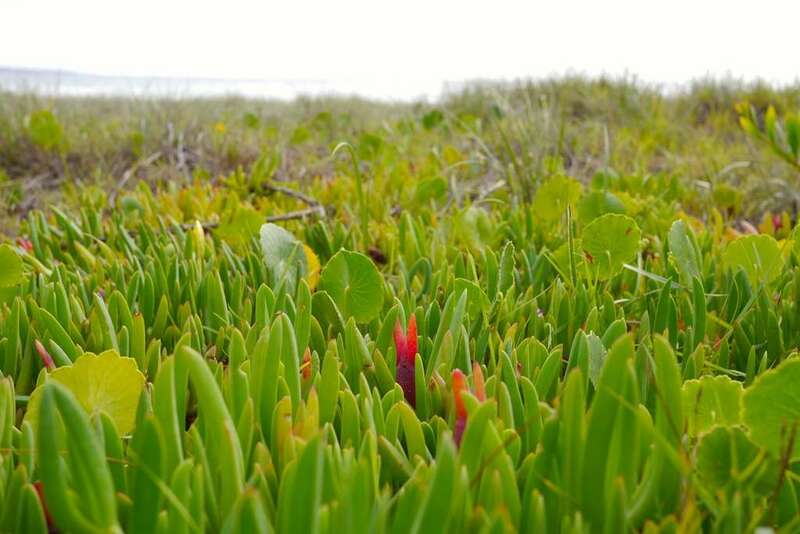 Lastly, a note that there are many Carpobrotus species, some of which are native and some of which are not. 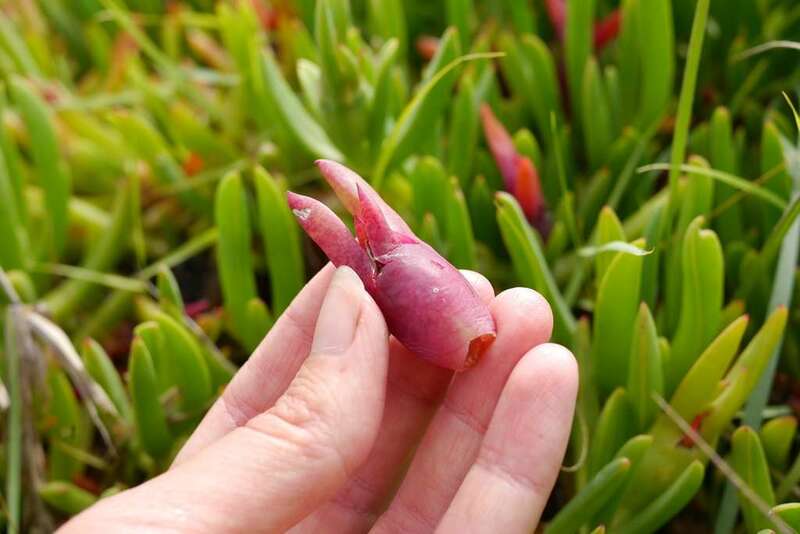 The two most prized for their fruit are Carpobrotus glaucescens (ie this one) and karkalla (Carpobrotus rossii), which is native to Victoria, South and Western Australia. The definition of a weed is subjective, I know. They're simply pl . .
Next to my primary school, down by the railway track, there is a . .
Hey what a great post! Pigface is a fantastic plant. We have found it is the perfect plant to grow on your nature strip instead of grass (in Melbourne) if yours is hot and dry. I read an academic trial a year ago which suggested that pigface was ideal indigenous plant to grow on a green roof And tasty as well! Great groundcover for fire protection too. In my county, Maricopa, more renowned for being the home of the worst sheriff in the world, we can grow iceplant, but I’ve rarely seen it fruit, because it will fail in the summer heat, and looks like compost fodder. This suggestion might fly in California, or contact the Desert Botanical Garden here in Phoenix, or The Sonoran Desert Museum in Tucson AZ. This tasty lil’ plant just might hold some slope, with an eastern exposure….Thanks for all you do, I love the posts. This is fantastic! Thanks as always for your great info. The first I have seen written about pigface. I ate some once while on a biology field trip on Fraser Island during my undergrad days, and it was really exciting. There’s something so exhilarating about native Australian foods, almost like a new frontier (but in a good way!). I never knew you could eat it but it is good to know. Wow, I had no idea? 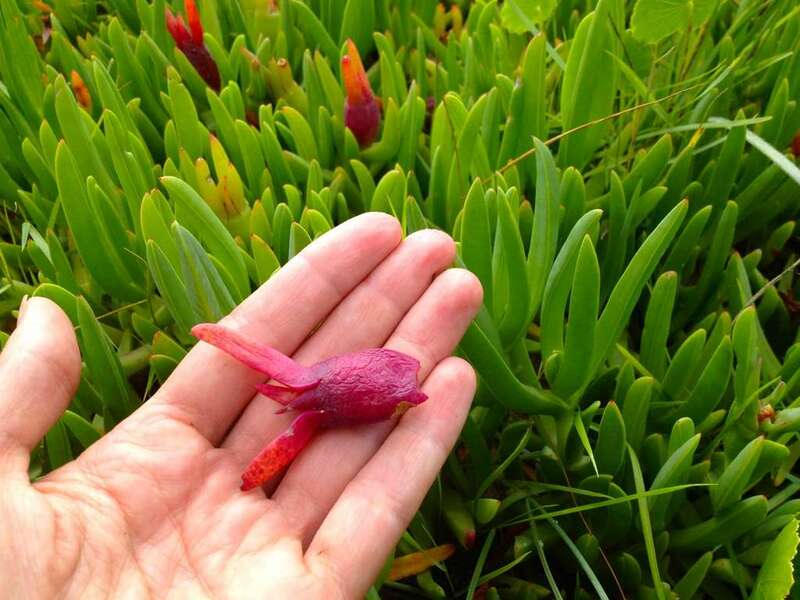 We have a plant similar to that here on the Pacific coast and I wonder if you could do the same? I’ll have to check it out! Oh wow! Thanks you. My daughter & I really like the vibrancy of pig face & have been talking about getting some. To be able to eat it as well will tickle my little 6 yr to no end. She loves foraging & I love her foraging with care as it’s way better than foraging the cupboard! After seeing you post about this a few days ago (perhaps on Instagram) I got curious on my walk around Browns River in Kingston Tasmania. But I’ll keep my eye out for red ones. I don’t think the one I tried was ripe enough. I am new to kingston tasmania and this week I found samphire on the banks of browns river. Delighted! I like the idea of pig face instead of pine bark/mulch. Does in transplant ok? 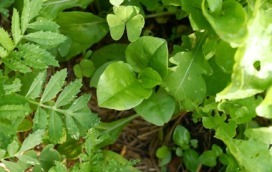 the small plants will transplant fine – good luck! Very interesting…I’d love to try it! I think I’ve seen very similar plants along the cost in Portugal and maybe Brittany. Yes, lovely, like salty plums. When I taught a PDC in South Africa in 1992 I noted they were sold en masse on markets and in greengrocers’ shops. “When I was working, with Jess Pernini, at the Asylum Seekers Centre at Surry Hills we had an amazing woman, known as Aunty Fran, D’harawal Elder, Francis Bodkin who is an environmental scientist, botanist, and author, come along and talk to our gardeining group and other clients a couple of times. She was advising us on our native front garden that we were establishing. She told us that local indigenous folks sucked the juice out of the coastal pig-face (Sydney region) and it was well know and used as an electrolyte drink. Very useful to know if a person is dehydrated. Lost in the bush, or no fresh water is available. Apparenlty is contains the right amount of electrolytes for rehydration.